Have you heard of the latest spot in town to pamper your babies? 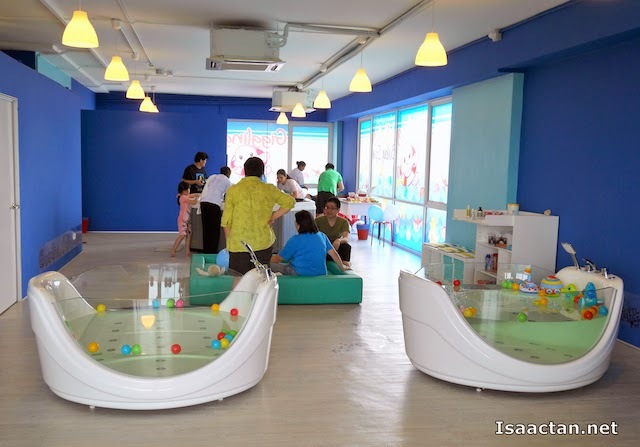 Introducing the Giggling Jellyfish Baby Spa located at Bandar Sri Damansara, where you and your babies get to be pampered with baby swimming, massage and family bonding sessions. Yes, you heard that right, baby spa, one which is catered specifically for your little one. Aptly named the Giggling Jellyfish Baby Spa, the aim of the centre is to provide a giggling good time with family and their babies. Three types of services and packages were available, baby swimming, baby massage, and a family bonding session where daddy and mummy can take a dip in the jacuzzi together with the baby. Arriving at Giggling Jellyfish Baby Spa with baby Martin, he immediately took a liking for the brightly coloured decor and these huge jacuzzis and toys. Baby Karlson could not make it for the visit as he wasn't feeling too well. We were given a private room, which was part of the family bonding session package. Here the parents can don their swimsuits and take a dip together with the baby. 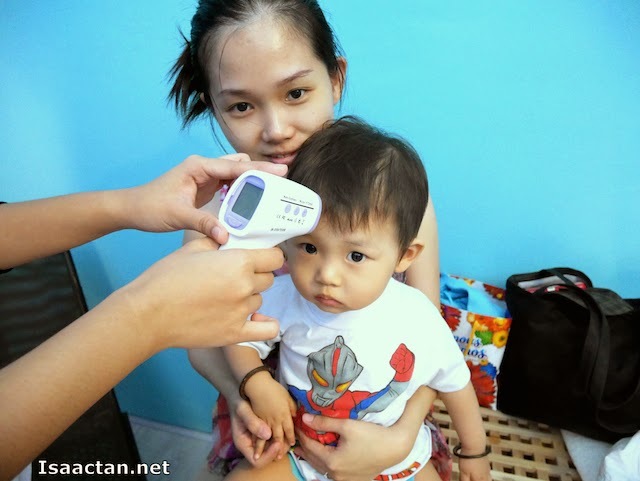 Part of the precautions taken at the baby spa was to take the temperature of the babies to ensure they are well. The baby is check to ensure he or she is not having any flu, fever or cough or has not gone for any injection and vaccination for the past 3 days. This is for the well being and health of the other babies at the spa. Now we haven't brought baby Martin very often to the swimming pool (Baby Martin's First Time In The Swimming Pool) and the closest thing he has to playing with water is during his daily bath times. A quick change into those waterproof diapers provided by Giggling Jellyfish, throw on a baby float, and he's happily on his way wading the waters of the tub. 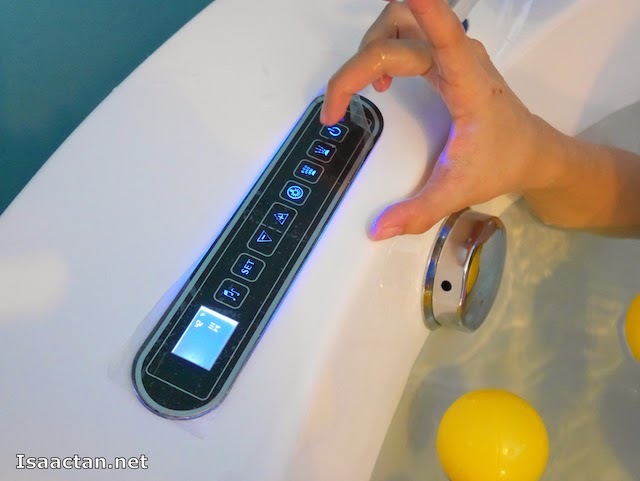 Immersing in warm water with your baby is a truly magical experience and these early bath experiences should be free from stress. I did see them enjoying themselves. The benefits to Mum and baby are boundless, strengthening the bond through skin-to-skin contact, whilst your baby develops water confidence and an understanding of water safety. Each baby can be accompanied by one (or both!) of their parents for this session. After a good splash in the tub, baby Martin had the opportunity to try out another package on offer from Giggling Jellyfish Baby Spa. He got to enjoy a full body baby massage! How cute is that, even I don't get to go for a full body massage and here you have babies getting the full treatment. Infant massage greatly enhances the early bonding relationship between parents and caregivers and their babies. By using gentle, physical stimulation along with loving verbal communication, a wonderful bonding experience is shared. Strokes can be either stimulating or relaxing, depending on your baby’s needs and developmental level. Giggling Jellyfish Baby Spa use only the best organic massage oil for your little ones. While the baby is undergoing his or her massage session, the mum is pampered with a neck massage. This is truly a great experience for both parents and their babies. Babies nowadays have all the luxuries in the world, something unheard of from my time, or my parents' time. It's all good though, if you really want the best for your kid. 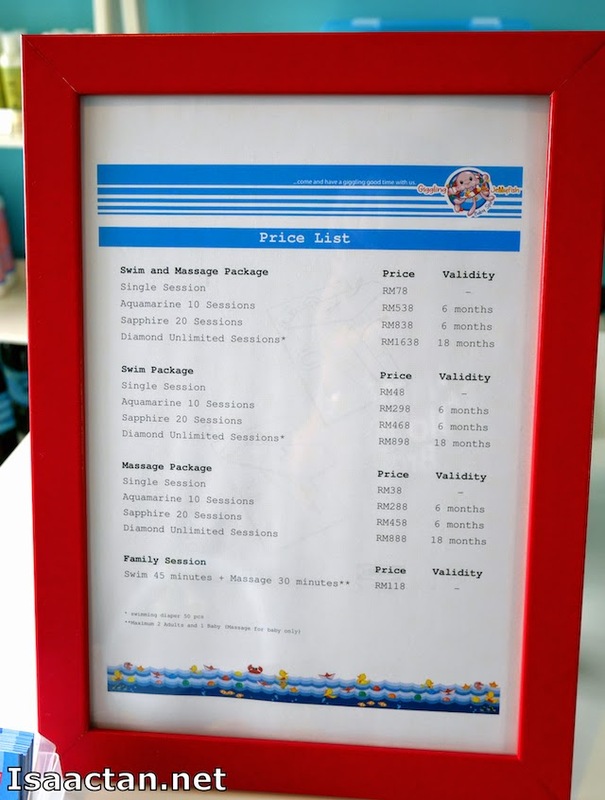 Giggling Jellyfish Baby Spa Price List as of Sept 2014. For booking or cancellation of booking at Giggling Jellyfish Baby Spa, do call +603 6262 6762 or Whatsapp / Line / SMS to +6012 383 1735. Take note the place can get very packed and busy during weekends so make your appointments early to avoid disappointment. So, if you wish to have a nice pampering session for your loved ones, why not give them a call and head on over to the Giggling Jellyfish Baby Spa @ Bandar Sri Damansara today! So nice. Kids these days are so lucky! He's ok now, got over his flu? This place is having much more that parents need for their baby. Combined spa and massage service is really appreciated and will be preferred by many. Massage is mandatory for babies at an early months to make them stronger. Benefits Of Baby Massage. Thanks for adding the price chart. This article is elaborating all about the new spa and massage center. One can get the complete info from this post. The price is also affordable.